We have walked through the first three steps required of us in 2 Chronicles 7:14. At least I hope we have. If we haven't, there is still time. so He can hear from Heaven, forgive our sins, and heal our land. As difficult as all 3 steps have been, step #4 may just be the hardest one yet. When it comes to turning from our wicked ways, we are a willingly-oblivious bunch. As Christians, those who are called by God's name, we like to brush our own sins under the rug. It makes us feel more holy and sanctimonious to point our fingers in the direction of others. thieves, fornicators, drunkards, drug addicts, and incarcerated. I am only quoting It. If you need proof, here it is...straight from the mouth of God, not mine. nor swindlers, will inherit the kingdom of God." He created a holy Heaven. Sin will never make it past its gates. In these two verses, there are exactly 10 sins listed. We, as Christians, are quick to accentuate and point out exactly eight of them. We love to talk about eight of them. The worship of anything or anyone other than God is sin. Men acting like, or pretending to be, women is sin. we like to pick and choose. We like to lump sin into categories. we can justify the ones we have self-determined to be "innocent", less-offensive-to-God sins. There are no "innocent" sins, my friends. Sin, of any form, will stop us at the gates of Heaven. God will not give any of us a pass, if sin is present when we stand before Him. will stand out like a sore thumb when we are standing alone in the presence of Holy, Almighty God. that certain sins will land us in Hell, but other sins will slide right on past the gates of Heaven? There are no accentuated words in I Corinthians 6:9,10. And we have no right to add emphasis to what God has already written. I specifically omitted "the covetous" and "revilers" from my list above. that some sins are worse than others. That it has become commonplace for us to categorize sin. We have foolishly constructed two sin compartments, really. ones that God will overlook. we quickly drop them into the "God-isn't-so-concerned-about-this-one" pile each time we feel the least bit convicted. Let's talk about those other two sins....you know, the two we chose to leave out, shall we? It is mentioned right along with the others. not at others, but at ourselves? How many times do we covet? Someone else's car, house, job, status, even spouse. We are competitive, trying to outdo one another and overachieve. We are never satisfied...always wanting more. More "likes" and "tweets" and "friends" and "shares". We love numbers...and feeling like we are most-liked. that we don't stop to think about whose rights we are trampling on to achieve it. begrudging one another's successes and victories. and long to receive glory that only belongs to God. hoping to be bragged upon. longing for more money and more of this world. 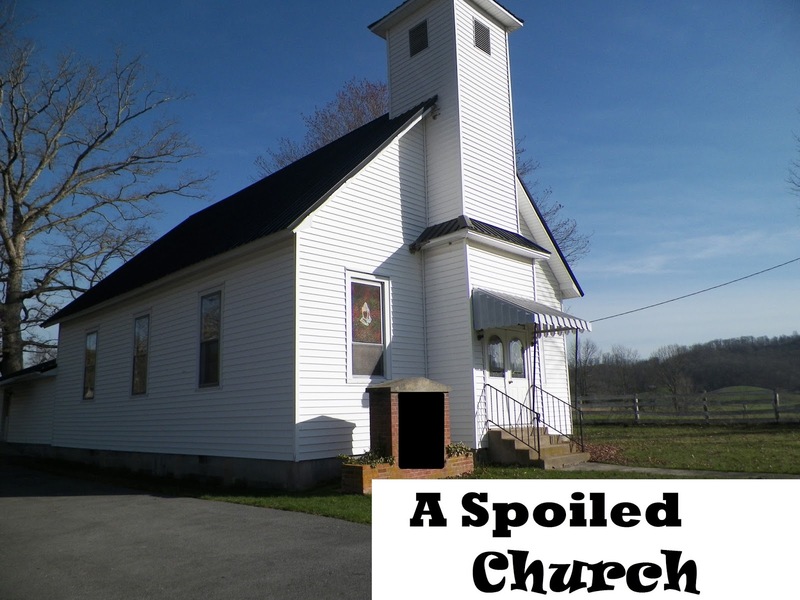 we would no longer be a spoiled church. Let's call it what God calls it. A person who covets is committing sin. And what about those "revilers" mentioned in the above verse? We do NOT like to call it sin...when it is in us, do we? How often we dole out abuse! How often we injure the reputation of another by way of abusive insults! Social media provides an unlimited platform for good. It can be used in the best and most edifying of ways. But, all too often, we use it to self-promote and insult others. It is so much easier to utter hurtful, abusive words when the subject is not standing in front of us. We have convinced ourselves that saying it online makes it less mean-spirited and less offensive. And what about our gossiping off-line? as we air their dirty laundry, magnify their failures, and gloat over their defeats? but who love Jesus just as much and are trying their utmost to please Him? Reviling, through whatever means it is executed, is sin, my friends. Just like the other eight. because we compare different types of sin and convince ourselves that the wrongs we consistently commit are not as sinful as those who do not profess Christianity. We don't like to admit that there are any wicked ways...in us, do we? We say we live "above sin", but we show ugly, hate-filled attitudes towards anyone and everyone who happens to disagree with us on any given point. and, in our pride and arrogance, we foster hostility and ill will. Tell me, whose sin is greater? Are there levels and degrees and categories of sin? All unforgiven, willful disobedience will land us separated from God for eternity. We pass off step #4 to the unbelievers. it is addressed to us...the Christians...God's people. He would never have told us we needed to. that we feel we have no wicked ways from which to turn. In addition to the two mentioned omitted sins above, we are guilty of so many others. We rob God by withholding required tithes and offerings. and prove Me now herewith, saith the LORD of hosts, if I will not open you the windows of heaven, and pour you out a blessing, that there shall not be room enough to receive it. If we were half as diligent about giving God His rightful 10%, plus offerings, as we are interested in building our bank account, God's cause would never suffer. And just in case we have bought into the opinion that tithing was only intended for the Old Testament, may I respectfully remind us that Jesus Himself commanded and reinforced tithing? "What sorrow awaits you teachers of religious law and you Pharisees. Hypocrites! but you ignore the more important aspects of the law--justice, mercy, and faith. You should tithe, yes, but do not neglect the more important things." "Lie not one to another, seeing that ye have put off the old man with his deeds..."
when Jesus said that our reaction to these needs will determine who is a sheep and who is a goat on Judgment Day. and we take the risky chance of offending God. Not every, single thing is spelled out in readable black and white. Being filled with His Spirit will infuse His guidance into our lives. give God the benefit of the doubt, and leave it alone. It is always better to err on the side of caution when one's eternal destination is at stake. We refuse to take a stand by withdrawing from participation in the political process. It is high time that we shake off our lethargy and become proactive. We all have a personal accountability in this. We all must do our individual part. There is a presidential election on the horizon. As Christians, what will we do about this? Will we choose to stay home on election day, as so many of us have chosen to do in the past? Do we have no individual responsibility? He giveth wisdom unto the wise, and knowledge to them that know understanding..."
I have heard so many Christians use this verse as a cop-out for not voting. They contend that God is the One Who removes and sets up kings, so they have no personal responsibility or role to play in this. We need to "anoint our eyes with eye salve that we might see." Do we not realize that God is the One Who entrusts us, His people, with the privilege of being able to vote, and that if we do not implement and exercise this privilege, we are, in essence, handing that right-of-way over to others who may not be led by His Spirit in their voting decisions? Is this a risk that you and I can longer afford? As God changes the times and the seasons, He gives wisdom, knowledge, and understanding to His people and moves their hearts in a certain, particular direction. If we do not respond to this moving of His Spirit, we will be held accountable for the outcome. a system of government in which we all may have a voice and make that voice heard by way of casting a ballot for the candidate who comes closest in line with our personal beliefs and convictions. I am not going to apologize for being too "political". It is high time we stopped apologizing for the truth. We can afford to separate our faith and our politics NO LONGER. The time has come that the two must merge and become one. How can we possibly cast our vote for those who oppose our Christian faith? How can we vote for those who believe in the exact opposite of Biblical truth? How can we not vote...at all? we should never place our trust in men. They are subject to indiscretions, scandals, and every aspect of the human condition. my hope is in God, and in God alone. I will not use this platform to try to influence and convince you to vote for one particular candidate. I do not know the future or God's mind, and I cannot predict what a person will do in the future. that are so near and dear to our hearts, and that stand in such jeopardy. It is a dear privilege to have this freedom. Our forefathers made great sacrifices to make it possible for us to choose our leaders. I feel like this is one of the most important presidential elections ever. Keep in mind that whoever is elected will more than likely be handed the free rein to personally choose and appoint at least one, possibly more judges to the Supreme Court. This is a lifetime appointment. As we have painfully learned, these nine judges wield an enormous amount of influence over the spiritual and moral direction of not only our generation, but any generations that may follow us. Do you not sense the urgency? Will you embrace your own personal responsibility? I have heard such lame excuses as someone not wanting to register to vote for fear of being called upon for jury duty and other such flimsy rationalizations. I implore you to consider the greater cause, and set aside your own conveniences. Oh, there is so much more on my heart, and this post is so long already! Transforming this burden into a book is sounding more probable to me by the day. Truly, I feel I am only skimming the surface, and it would take a book to contain it all. but take it in a slightly different direction, in the next post. 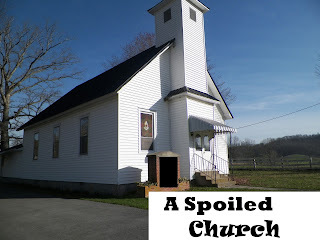 Stay tuned for Part Nine of "A Spoiled Church"!!! appreciate you sharing this series. Thanks for sounding the clarion call Cheryl and be willing obey God's voice. Have a blessed weekend. Hi Cheryl! I think your point about judging our sin is a good one. I know that I tend to think that what I do 'isn't that bad' compared to what I see in the newspaper or on the news. But I can't measure myself against others. I have to look to the one who guides me and rules me. HE is the one who will judge me, on my works along. May I never decide that my sins are 'okay'. They're aren't. I have often thought about this issue of sin, and how we humans approach it. It seems to me that we like to *rate* sins. We like to think there are the really bad ones, and then the not-so-bad ones. We are quick to judge and condemn others for committing the bad ones, and then dismissing our own not-so-bad ones. But, to God, it is all the same. There is just SIN, and it manifests itself in many ways. And, it doesn't matter if you miss His perfect standard of holiness by an inch or a trillion light years. We ALL miss the mark. Great words here, and much to ponder. I just happen to think that we all need to stop being *speck-in-the-eye spotters* and attend to the *log jams* in our own lives. And that process begins with humility, and the willingness to look at what's rotten in our own hearts. Wow, I loved what you said about it doesn't matter if you miss His perfect standard of holiness by an inch or a trillion light years. This is so true. Yes, dear Lord, help us to stop criticizing the mote in our brother's eye while overlooking the log in our own. Thank you for your support and encouragement, dear friend. God bless you! I feel sorry for pastors and leaders these days with all the political correctness they endure. My pastor preached one of those "no minced word" sermons a few Sundays ago and when a bunch of us encouraged him, he told us all the same thing: "I was afraid." I just read that chaplains now are forbidden to call homosexuality a sin. May we all remember the call to holiness and call sin what it is and confess it by name. May we all ask God to search our hearts and reveal those hidden (tiny) sins that are just as big as what we call big. It is time to mean business with God and to daily repent, seek His face and humble ourselves before our Lord. May we rejoice when others prosper, and be willing to share with those who have less. I asked permission to share at the evening service at our church. I told the Pastor, I know who is there on Sunday nights. (most are from our Rescue Mission) and I told Pastor, maybe they need to hear the gospel from a Grandmother. I send him an e-mail of my sermon, and he said, that I goes along with his morning message so to go ahead. Later when I was home, negative thoughts came, "You really messed up." Immediately the Lord spoke, "Not so, for did you not notice how well they all paid attention?" :-) I turned the service back to the Pastor and God showed up. I would have loved to have heard your sermon, Hazel. I read it on your blog and was very blessed by it. God bless you abundantly. Thank you for your encouragement. I should have never doubted that you had more! Excellent points, sister. "Glory that only belongs to God." That really stood out to me. Our fallen flesh craves what we haven't earned nor could we ever hold up under. Look at the famous worldly people that cracked under the weight of being glorified. It was only meant for the One that provides every breath for every person every second of everyday. As for the politics; The verse, "Blessed is the nation whose God is the Lord." jumped into my mind. It's pretty easy to see that the implication is that the nation whose god isn't the Lord are in for dire consequences. I'm praying for this country with you, sister. Keep up the powerful ministry. Wow, such amazing words, Floyd! I never thought of it that way...about the ones who have cracked under the weight of being glorified. That glory was never meant for us. It is meant for God. We cannot handle it, as you said. Thank you ever so much for your encouragement and support. It means more than I can say. God bless you, brother. We live in terrrible times Cheryl. Unfortunately the enemy is succeeding in blinding many to the fact that we are actually in the end of times. While we strive to make sure we are in tune with God and His word, we must not seize to pray and lend our lives to join with God as Harvest hands for His kingdom. This is a very timely topic, God help us all. Love it! Wow, part 8! You have put so much out there. You are reaching so many with such a message! Keep writing the truth. Love you! P.S. Just posted one on my blog, "I Will Never Allow Satan To Silence Me". Thank you, sweet friend. I so appreciate your love, friendship, encouragement, and support. I can't wait to read your post!! Love and appreciate you. I really needed this!! The part injuring another's reputation it is so easy done. I would like to print your series out to pass on to my sister if that is okay. Keep writing the truth!! !